The new BERNINA 530 and 550 QE models will wow you with their simple, classic design. BERNINA engineers believe elegant form should be combined with superior function to set new design standards. Whether you’re sewing or quilting, modern aesthetics plus cutting-edge technology are an integral part of the package with the BERNINA 530 and 550 QE. The BERNINA 530 and 550 QE boast cutting-edge features developed by a team of experts in Switzerland. They combine ingenious sewing applications and intuitive navigation to produce a machine that is elegant simplicity itself. The BERNINA Stitch Regulator (standard with the B 550 QE, optional with the B 530), designed to assist you in mastering free-motion stitching techniques with ease, is just one of many BERNINA Innovations. For decades, BERNINA has been passionately committed to developing cutting-edge sewing and embroidery machines for creative people. Swiss precision is at the heart of every product we make. BERNINA—standing for Swiss tradition since 1893. BERNINA—made to create. The BERNINA 530 and 550 QE provide an exclusive level of stitch control. Whether altering the stitch length (up to 5 mm), width (up to 5.5 mm) or needle position (up to 11) or even creating custom combinations, you’ll appreciate the convenience of a machine that remembers the stitch details for you. The BERNINA Stitch Regulator (BSR) is designed to assist you in mastering freemotion techniques by keeping stitches consistent at variable sewing speeds. The BSR offers confidence for the beginner and additional insurance for the experienced quilter. The BSR comes standard with the B 550 QE and is an optional accessory for the B 530. Let your B 530 or B 550 QE keep track of the details with multiple memory functions. Both models remember the changes you make to the stitches as you use them in your sewing session. They will also remember your favorite stitch settings for each stitch when saved in a long-term memory. For creative applications, you can save up to 100 stitches in a combination. The B 530 and B 550 QE include a library of over 140 and 180 stitches respectively, conveniently stored by category for a wide variety of applications. You can view and select stitches directly or use the easy-to-navigate screen. Whatever your sewing project, you’ll find the perfect stitch. With the one-step automatic buttonhole function you will have consistent buttonhole length time after time. You’ll appreciate the user friendly features and simple interface. The crisp LCD displays all your settings at a glance. The built-in Sewing Consultant is ready to assist you at anytime. The practical semi-automatic needle threader lets you start sewing faster. With the BERNINA 530 and 550 QE, you’ll spend more of your valuable time sewing and quilting. 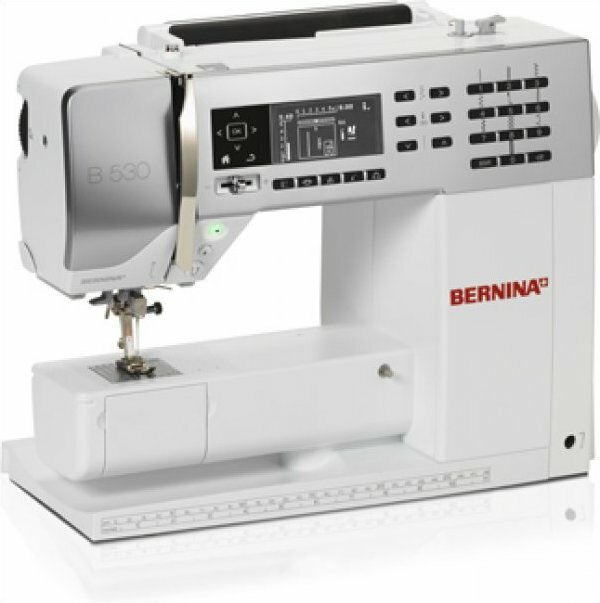 The BERNINA 530 and 550 QE were designed with your sewing future in mind. A variety of special accessories and presser feet are included with the machine. When you are ready to expand your options, you’ll find a broad range of accessories available. Whatever new techniques you want to explore, you’ll find the right accessories to help grow your sewing and quilting skills.